In many ways it changed everything. 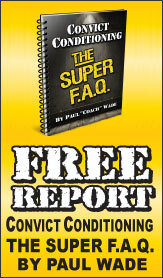 It gave validity to the concept of strength training as a powerful means of fat loss. It gave everyday people the ability to perform one of the most effective methods of strength training. It could fix lower back issues without the use of tedious and ineffective rehab drills that have disillusioned so many people. For the above reasons and more, the swing propelled kettlebells from being a potential fitness fad to a powerhouse training system that has and will continue to stand the test of time. But, does it really stop at the swing? I’ve been a bit frustrated watching people think that increasing the load (weight) of the kettlebell is the most effective means of progressing the swing. While going heavier is an option, it isn’t always the best option. Programming the swing is often limited for those who may not know how to progress the movement. The term "movement" may have joined the ranks of words like "functional" and "core". What does "movement" really mean? Are we really training to improve the quality of movement? Some would argue that this list is pretty extensive, but in truth, this list is very limiting for most strength enthusiasts. Some trainers would say that the body can only move in so many ways—there is some truth in that idea, but we rarely explore the body’s full potential. Gymnasts, martial artists, and acrobats move in a vast number of ways. But, these ways are often just a combination of basic movement patterns. Similarly, our movements in everyday life are not isolated iterations of a single movement pattern, but a beautiful combination of these patterns. Recently, Landon Donovan—professional soccer player—was asked what made many of the top soccer players so good. He answered, "They make it look so effortless." I agree. The truly great players are capable of quickly and seamlessly combining many movement patterns at once. This skill requires very developed movement patterns and functional strength. How does these concepts relate to progressing the kettlebell swing? We could consider adding complexity to the swing’s hip hinge, and many people already do that in simple, powerful ways such as switching to single-arm swings. This one subtle change can have a profound impact on the quality of the kettlebell swing movement. In the DVRT Ultimate Sandbag Training System, we are adamant about using the right tool for the right job! For kettlebell swings and their variations, kettlebells work best. 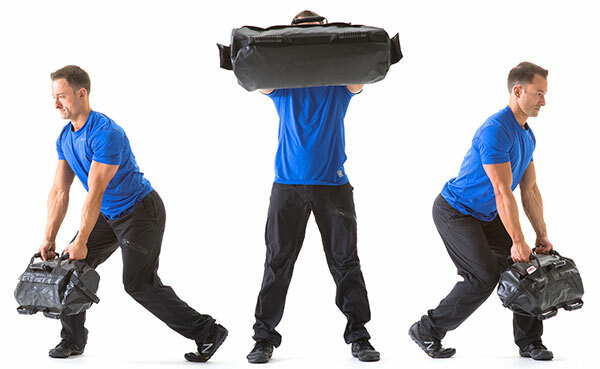 But since we don’t swing Ultimate Sandbags in the same way, they open up a whole new and different realm of movement. Both the Shoveling and Rotational Lunge exercises are what I call "evil cousins" of the kettlebell swing. These two exercises have the same principles of the kettlebell swing, but drastically change the feel, outcome, and complexity of the swinging movement. Shoveling adds a strong rotational component to the traditional swing. Rotation is a crucial movement pattern that far too many people leave out of their training. Years ago, the National Geographic Channel had a show called "Fight Science" which examined many different martial arts styles, and fighting sports. The show even measured impact forces, biomechanics, and other relevant information. What did all of the fighting styles have in common? Almost all of the punches and kicks started with the foot applying force to the ground which began a rotational chain of movement throughout the entire body. This rotation gives power to the movement. The same is true for the rotation in a golf swing, baseball pitch, tennis serve, or when kicking a football. Rotational movement is simply more efficient and powerful! Shoveling is a power packed drill for learning the concepts of swinging in the transverse plane. You have to progress to it, but the progressions should be in any good program. 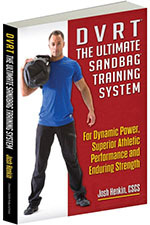 Our most famous DVRT Ultimate Sandbag Training drill is the Rotational Lunge. Just as the kettlebell swing is unique to kettlebells, the Rotational Lunge is really unique to our DVRT Ultimate Sandbag Training System. The Rotational Lunge movement contains hip flexion to absorb the weight of the Ultimate Sandbag, a quick re-transmission of force, and rapid hip extension necessary to project the weight out in front of the body. The difference between the Rotational Lunge and the kettlebell swing should be quite obvious. It uses a much less stable body position, and the weight of the Ultimate Sandbag moves down while moving around the body. This difference adds the important elements of anti-rotation, hip stability/strength, and makes it a full body exercise. 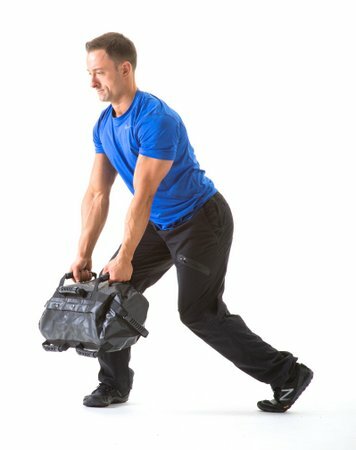 The Ultimate Sandbag Rotational Lunge is such a powerful conditioning exercise that we have seen it cause higher heart rates than two-handed kettlebell swings with twice the weight! Once again, I’m not telling you to stop practicing kettlebell swings, instead I want you to combine these elements to make an invincible program. Firstly, make movement quality the first priority. Then, assuming you have the required proficiency in both movements, we have many options. You could perform this cycle 3-6 rounds. These are only a FEW examples of the creative and meaningful programs you can create—your world of movement is truly open to infinite possibilities. 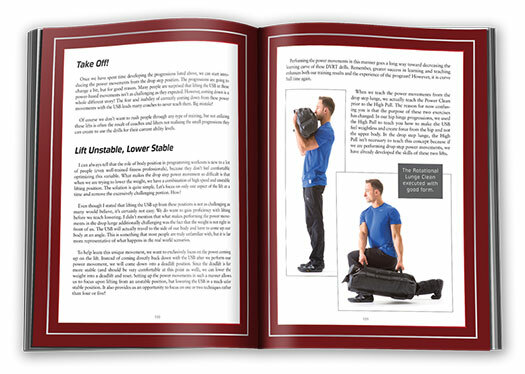 Josh Henkin is the author of DVRT, The Ultimate Sandbag Training System now available in paperback and ebook format.